Launched in 1977, at the dawn of a new golden age for motorcycling, the DT/MX Yamaha had a multitude of advantages. It was the best balanced of the new and fashionable breed of explosive trails bikes and a remarkahly reliable bargain. The public, tired of utility machines, welcomed this versatile new breed of sport bikes with open arms. 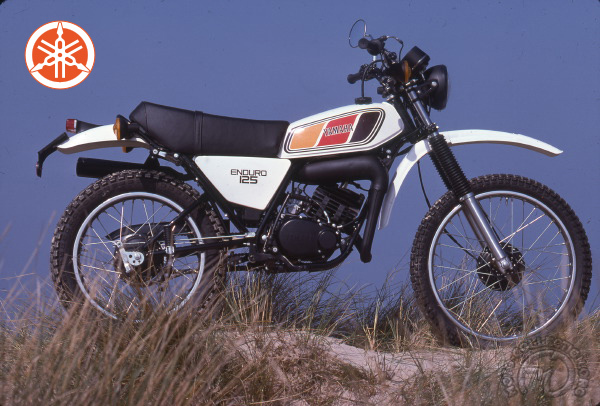 Off-road, they were a virtual match for real enduro machines. On-road, the comfort of their long-travel suspension was fantastic. Their lively engines and excellent handling made them an effective mode of transport in urban traffic. The French fashion of using trail bikes in town spread across Europe, starting with the Latin countries. The DT/MX copied all the latest refinements of the motocross machines. In 1980, it was given a cantilever rear suspension built up with square tuhes, with a shock absorber beneath the saddle. In addition, the DT/MX had an electronic ignition. In turn, it gave birth to the DT/ LC. But the basic DT/MX remained in the catalogue until 1993- and it still retains a faithful following among enthusiasts. Despite changes in motorcycle license regulations, which throttled sales of 125cc machines. The DT/MX remains one or the world’s top-selling motorcycles. Thanks to record sales or 20,000 units a year in France in the late 1970s, Yamaha overtook Honda to become market leader in 1977, 1978 and 1981 . In outstanding combinantion of value for money, quality and sheer enjoyabilily found the 125 DT/MX over 150, 000 customers in Europe alone.